The Old Biscuit Mill in Cape Town. That feeling when you step into a place and your senses are simply overwhelmed. Then you get accustomed to the cacophony of people and the sights start to blur but one thing lingers: the smell of food. A symphony of freshly-baked bread, smoked fish, grilled meats and fresh herbs and spices fills your nostrils, and there’s only one direction to choose: that which your nose dictates! Yes, THAT feeling. This is exactly how I felt when I first entered the Old Biscuit Mill in Cape Town‘s Woodstock district. As its name suggests, the Old Biscuit Mill used to be… an old biscuit mill. These days, it’s a vibrant village where people from all over the world come to celebrate food, art, design, photography and wine! 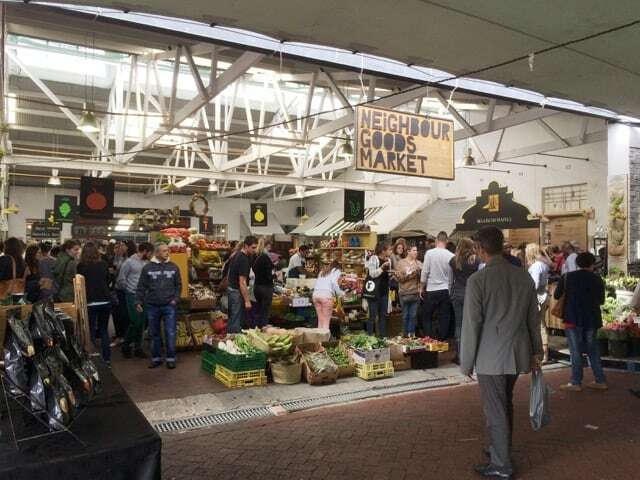 It’s a fabulous place to spend a morning and/or afternoon; you can stroll around the shops, indulge in a wine or beer tasting, shop for fresh produce and tuck into an incredible meal at one of the restaurants or food stalls. I let my nose guide me and I soon found myself in the ‘market’ section. What a treat that was! There were stalls with the freshest vegetables, seafood and meats on display but my nose led me to a food stall with skewers of fresh mushrooms on a grill. The smell of the grilled mushrooms was intoxicating and within moments, I had one in my hands. The juicy, lightly-spiced mushroom kebabs were simply divine! The divine mushroom kebabs! YUM!!! It was very clear to me: this market truly is a foodie paradise! There were all sorts of breads, sandwiches, Belgian waffles, cakes, cookies and other typical South African favourites like ‘biltong’ (usually dried, cured meats but I also found a stall selling a tuna variety). My nose soon led me to another stall where bacon and eggs pancakes were made. I’m not sure how I did it but I gobbled that down too! AND followed that up with a craft-beer tasting! This stall sold tuna biltong. And there were lots of cakes, pies and desserts. 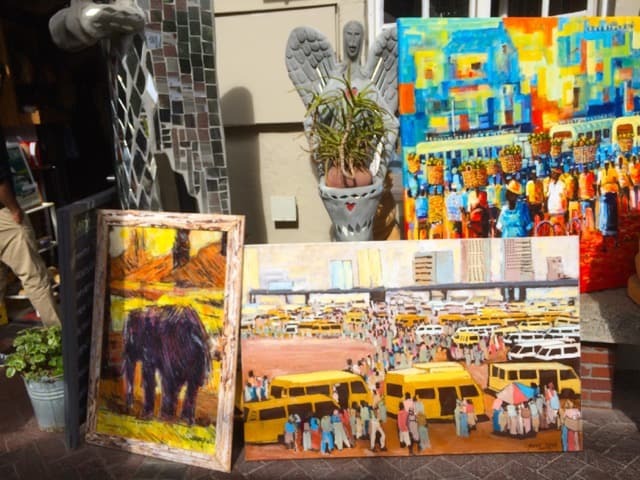 With my stomach full, I wandered around the mill and discovered a multitude of funky, sometimes quirky, shops selling clothing, furniture, fashion accessories, art and photos. Musicians performed at various spots, providing for a fun, festive atmosphere. I stopped for a lovely wine-tasting at Wine @ The Mill and ended with a delicious pizza lunch at Burrata. I loved the colourful art in this shop. 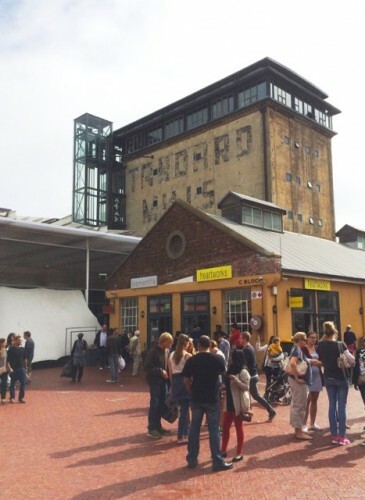 I once wrote about ten things to do in Cape Town, I would add the Old Biscuit Mill as an eleventh thing to do! You’ll, in most likelihood, be hit by “that feeling” but if you’re not, just let your other senses guide you for a real treat. Read more about Cape Town on Velvet Escape. Visit Cape Town Tourism for more information. Este mercado e as comidas são de dar água na boca.